Copenhagenize.com - Bicycle Urbanism by Design: Health Warning on Cars! The Ball is Rolling! Health Warning on Cars! The Ball is Rolling! Finally. 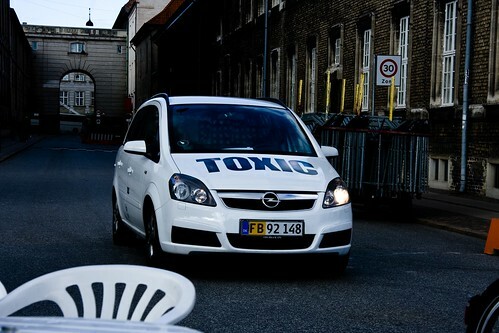 Almost a year after the Copenhagenize Think Tank developed the rational idea that automobiles should be forced to display health warning stickers identical to those on cigarettes packs, a car was spotted in Copenhagen sending the right message. Right there, in bold letters, an indisputable truth about the nature of the machine in urban settings. Okay, okay. It's actually the company name for a tattoo parlour here in Copenhagen - Toxic Ink. But don't tell anyone that. By the way the chap from the parlour is charming and enjoys posing for photographs. Health warnings for cars are available as small stickers in the Copenhagenize/Cycle Chic shop. Slap one on your neighbour's car. Giggle.